At the last compensation bargaining session in mid March, DPS Superintendent Tom Boasberg looked directly at the teachers in attendance and promised to deliver increased compensation if educators worked to persuade legislators to increase funding. As a result, DPS teachers marched in massive numbers on April 27 and the Colorado legislature approved $50 million in new DPS funding in early May. 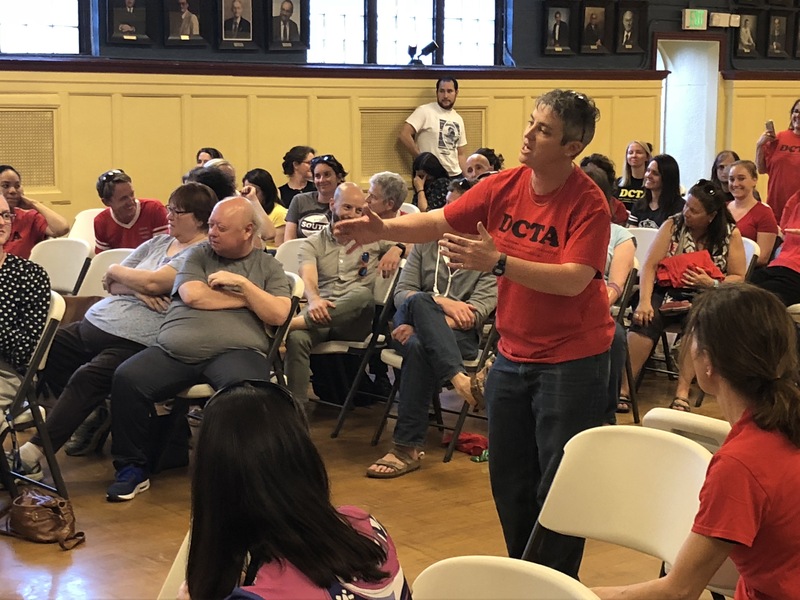 So educators throughout Denver were excited to hear Boasberg make good on his promise at last night’s Compensation Bargaining session, as well as eager to listen to details on how the new funding will be distributed. Unfortunately, Boasberg never appeared at the session – and district representatives that did attend offered no assurance the massive cash infusion into district coffers would be used for much-needed salary bumps to underpaid Denver teachers. In fact, DPS came to last night’s meeting with no new proposals, no new ideas and with no intent to bargain. As Shamburg spoke, loud applause erupted from the capacity crowd in the Knights of Columbus hall. The cheers quickly turned to jeers as district officials explained that up to $15.9 of the new funding had already been accounted for in compensation commitments the district made to teachers during last year’s Master Contract negotiations. According to DPS attorney Michelle Berge, the district anticipated these additional funds would become available, and therefore were able to make several teacher compensation concessions during negotiations last summer. “So you’re telling us that the district knew in August that Colorado’s economy was going to be booming in spring?” asked Shamburg. Throughout the night, teachers in attendance expressed anger, frustration and bewilderment at the inconsistencies between Boasberg’s promise of increased teacher pay and the DPS team’s insistence that new funding might be used elsewhere. What was completely absent from district representatives was clarity. DPS arrived with no new proposal in hand and vague explanations surrounding the new $50 million allocated to the district through the legislature’s passage of the School Finance Bill last month. A teacher at South High School who’s been with the district for nine years, Mitchell explained how teacher compensation is connected to the ongoing issue of disparate pay between men and women. In a profession dominated by female workers, teachers continue to fall behind financially to male counterparts in other professions, Mitchell explained. Mitchell was just one of several teachers who spoke up to explain to district officials how challenging it is to remain a teacher in Denver. Many teachers suggested they may need to leave the district or the profession in order to survive. Placido expressed praise and appreciation for his students, his staff and his school team, but he said he’s dismayed at the lack of support from the district. He’s planning to take a second or even third job next year in order to make ends meet – and he’s concerned he won’t be able to give his students his full attention as a result. Anna Noble, a 15-year DPS teacher, told district representative that despite holding a Master’s degree in chemistry and education, her DPS salary is woefully inadequate to live and support her family in Denver. Over and over, the mantra of “there’s no reason to stay” was a consistent theme among teachers in the crowd. Despite the litany of concerns expressed by teachers, stone-faced district representatives provided little to no indication they had heard and listened to the needs of the teachers they claim to value. In a slight hint at collaboration, DPS did agree to meet in bargaining again next month to continue discussions. And in an attempt to ensure that Boasberg heard the frustrations of teachers, a contingent of educators marched at the close of the session from the Knights of Columbus hall on Grant St. to district administrative headquarters downtown. “Where is Tom! Where is Tom! Where is Tom!” marchers exclaimed as passing drivers honked their horns in support. Denver teachers will take their concerns to the DPS Board Meeting tonight to continue educating the district about the urgent need for increased teacher compensation. All teachers concerned about their future are urged to attend and make their voices heard. The meeting begins at 5 p.m. at the Emily Griffith Technical College on 1860 Lincoln St. in Denver.